Trump's decision to pull out of the agreement unilaterally has infuriated Washington's closest allies in Europe. BRUSSELS — In the wake of President Trump’s decision to withdraw from the Iran nuclear deal, European leaders on Tuesday began discussions about how they might sweeten the deal to keep Iran from restarting its nuclear program and stand up to coming U.S. sanctions on companies that do business in Iran. The top diplomats of Britain, France and Germany were meeting in Brussels with Iranian Foreign Minister Mohammad Javad Zarif and the European Union’s chief diplomat, Federica Mogherini. Those countries were all signatories of the 2015 deal that aimed to prevent Iran from building a nuclear weapon in exchange for economic incentives. Trump’s decision to pull out of the agreement unilaterally has created one of the biggest foreign policy crises of his presidency, infuriating Washington’s closest allies in Europe and driving them to consider whether to order European businesses doing business in Iran to ignore U.S. sanctions. That would be the diplomatic equivalent of a slap in the face. In Tuesday’s meetings, Europe and Iran sought to preserve the landmark agreement. “The U.K. and our European partners continue to view the nuclear deal as vital for our shared security and remain fully committed to upholding it,” British Foreign Secretary Boris Johnson said ahead of the meetings in Brussels. He said that he would work to protect European businesses from being hit by U.S. measures if they continue to trade with Iran. Zarif said he was optimistic that Iran and the other parties to the agreement could find a way to keep it alive. “I believe we are on the right track to move forward in order to make sure that the interests of all the JCPOA’s remaining participants, particularly Iran, will be preserved and guaranteed,” Zarif said after a one-on-one meeting with Mogherini, referring to the deal’s official name, the Joint Comprehensive Plan of Action. Trump’s decision has created a tricky game of strategy for other countries that remain committed to the agreement, which was endorsed by the U.N. Security Council after years of negotiations. Iranian President Hassan Rouhani has staked his political legacy on delivering prosperity for Iranians through the deal, which is now threatened by the new U.S. sanctions. Iranian hard-liners who always felt the agreement made too many concessions may be emboldened to restart nuclear enrichment, but they could risk airstrikes from the United States and Israel if they did so. 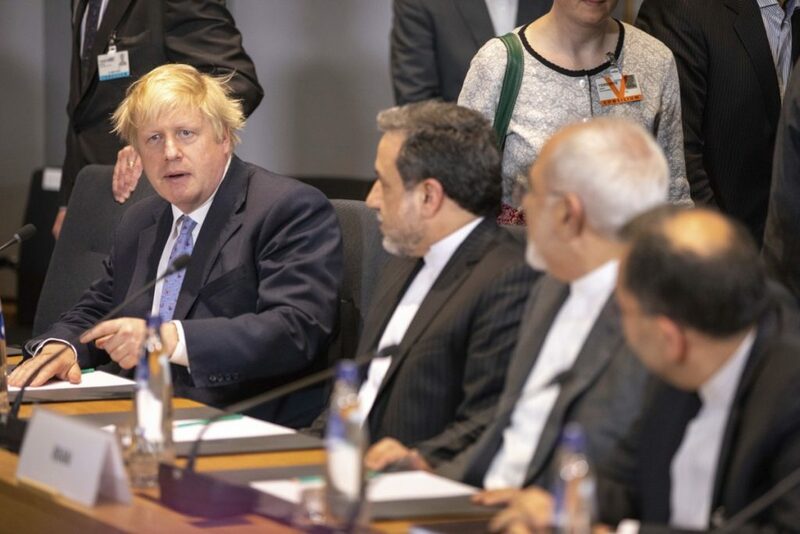 The split Iranian position was clear Tuesday, with other leaders adopting a tough stance in Tehran as Zarif offered a friendlier stance in Brussels. “We have the capacity and we are ready to resume our nuclear activities to a much higher level if the talks fail with Europeans to save the nuclear deal after America’s exit,” Iranian Atomic Energy Organization head Ali Akbar Salehi was quoted as saying by Iran’s Fars news agency, Reuters reported. In Europe, leaders are faced with a decision about whether to treat their longtime closest ally, Washington, as an adversary, marshaling their economic might to engage in full-out economic conflict. They remain deeply dependent on the United States for security guarantees against Russia – something Trump has grumbled about – and are in the middle of negotiations over an exemption to new U.S. tariffs on steel and aluminum. The leaders of the 28 nations of the European Union plan to discuss their response to the U.S. pullout at a Wednesday summit in Bulgaria. One option is to invoke a never-before-used “blocking mechanism” that would direct EU businesses to ignore the U.S. sanctions. Foreign ministers plan to discuss “the measures we can put in place at a European level and at a national level to protect our investments and to guarantee that the deal continues to be fully implemented,” Mogherini said ahead of the meetings. But diplomats have doubts about whether EU countermeasures would be effective, since most big businesses are unlikely to risk their access to the U.S. market in favor of much smaller potential rewards in Iran.